Sophomore Maddie Dawson steals a pass from an opponent during Westlake's April 6 playoff game vs Lake Travis. 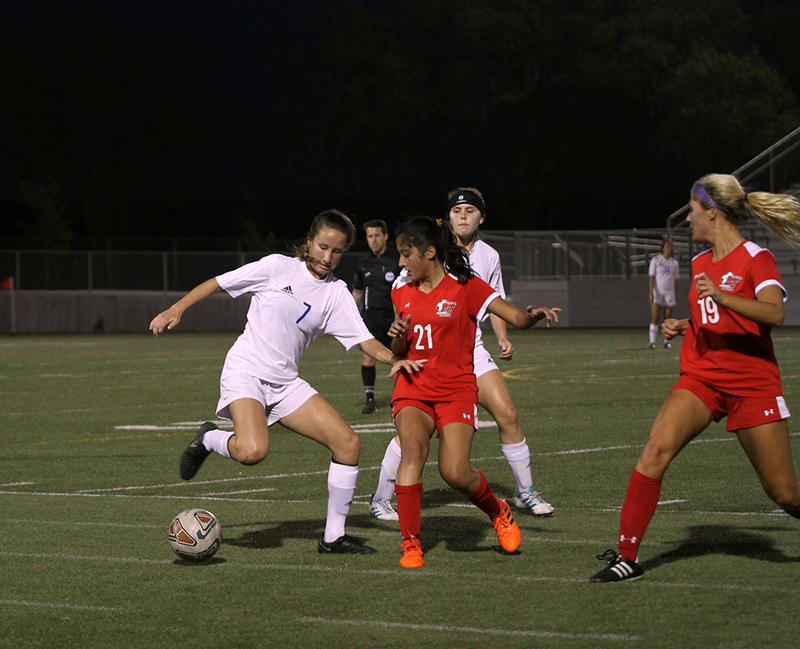 After making it to the third round of the playoffs, the girls varsity soccer team lost 0-3 to Lake Travis April 6 after beating them once and drawing against them in the regular season. Senior Claire Schaffer is the only player who signed to play at the collegiate level. She will play goalkeeper at California State Polytechnic University at Pomona. With the season ending, the varsity team will lose six senior players. This year’s juniors total 12, and sophomores number 16, so next year’s roster should be deep. For the others, the Lake Travis game marked the end of their high school soccer careers. “I hope they continue on in some level of soccer because I think you can play until you’re 105,” Carruthers said. Over the course of the season, the players formed a tight bond which transitioned onto the field.